A statue of Charles Rennie Mackintosh has had a cone placed on its head - just 10 days after it was unveiled. It was uncovered in the city's Anderston area to mark the 90th anniversary of the designer's death. The addition of a cone is in keeping with local tradition, which sees the Duke of Wellington statue in the city's Royal Exchange Square wear one. 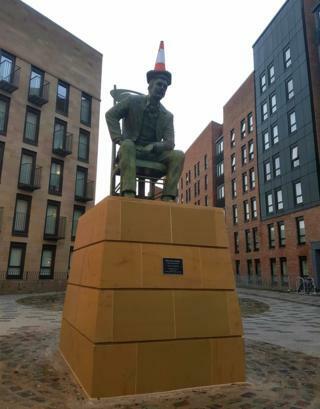 Some locals say the cone demonstrates Glaswegians' sense of humour and is as important as famous landmarks. In 2013, Glasgow City Council tried to end the practice, but abandoned their plans after a public backlash.